Home>New Songs>Sam Sneak Songs> Sam Sneak, Nipsey Hussle, Curren$y & Wiz Khalifa Release "Mary Jane"
If you haven't milked the day for all its 4/20 content, save yourself a morsel for this banger. Rick Ross and protégé Sam Sneak spent a good part of yesterday hyping up the release of "Mary Jane." Their search for the perfect cast landed them Cannabis connoisseurs from distinctly different corners of the map. "Mary Jane" is equal parts seductive, in the sense of a contact high, and lackadaisical by virtue of its major proponents. Nipsey's expertise may lie in moving packs but Curren$y is no stranger to smoking through his bag, and well Wiz Khalifa is so droopy he probably couldn't hack it in any other profession. Even if professional conduct were put to test, we wouldn't lose sleep if the job got done at days end. What makes this record pop, is each rapper's willingness to fall into character. 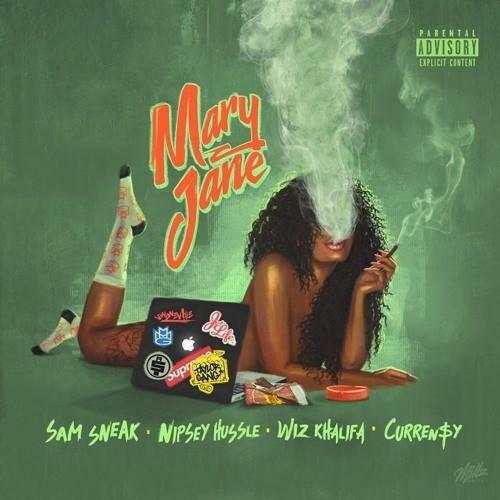 SONGS Sam Sneak, Nipsey Hussle, Curren$y & Wiz Khalifa Release "Mary Jane"